I'm Not Happy with My In-Home Caregiver. What Should I Do? 06 March I'm Not Happy with My In-Home Caregiver. What Should I Do? If you're not happy with your home caregiver, the immediate reaction might be to fire them. After all, who wants someone they don't feel comfortable with being in their home all the time? Pause for a second here, though. That's not always the most reasonable solution. If your knee-jerk reaction is to fire each caregiver not meeting all of your needs from day one, you're going to be in for a very difficult journey. That being said, it’s essential that you or a loved one get the care experience you deserve, or find a way to pursue that. Top agencies strive for exceptional client satisfaction (we’re especially proud of our Provider of Choice award), and you shouldn’t sell yourself short. We’ve worked with many clients in communities around the U.S., and have extensive experience tailoring our approach to best serve clients and their loved ones. We’ve also heard stories of what hasn’t worked for them before. To ensure everyone is getting the care that’s right for them, we’ve put together some suggestions about how to handle this situation that can be tough for all involved. One thing you should realize is that any new hire will bring an adjustment. You're adding a new person to your household. They have their own background and quirks, as do you. Many people are uncomfortable with having a home caregiver for quite a while. It's like having an extended house guest - you might not feel like you can relax in your own home. An adjustment period is normal. It's perfectly acceptable to raise issues that are important. It's also perfectly acceptable to decide a caregiver is not right for your family, for whatever reason. But it's also essential that you really consider every possibility that might cause your unease. The first question you need to ask yourself if you're immediately unhappy with your in-home caregiver is whether or not you gathered all of the information you needed before they were hired. If you agency provided you with every possible bit of information and you're confident that the caregiver is competent, it might just be a personality conflict. The good news is that a personality conflict can sometimes be overcome through good communication. If, in retrospect, you feel as if you did not have all of the information you would like prior to placing the individual, contact your agency. They should be able to give you a fuller picture of your caregiver and plan, and should act as an advocate to help you assess the situation and assuage difficulties. Here at Bluebird, we make sure that you or your loved one is recieving the best care possible— discover the quality of care provided by our caregivers here. 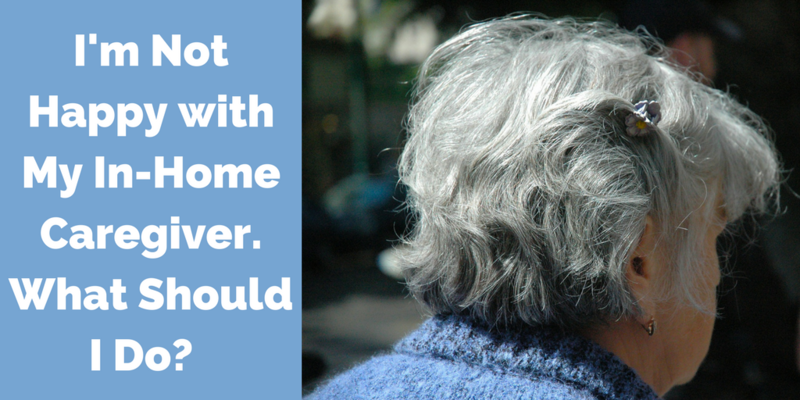 Discontentment with your home caregiver is a serious issue. It's important that the patient is comfortable at home and that they build a trusting relationship with their caregiver. To better assess the situation, you need to have comprehensive conversations with the agency. Prior to scheduling a time to speak, it helps to really consider all of the conflict points. Write down any questions you might have. Remember, too, that your agency will likely have some feedback to help you form a more well rounded opinion of the situation, because they work in the field and are familiar with the struggles of adjustment in these situations. Writing up a list of questions and thoughts will help you gather better information and help the agency provide better advice. Once you've been in communication with your agency, consider all of the support and help that they offered in assessing the situation. They might laid out some options and given you a recommendation for moving forward. Often, it’s helpful to make a list of pros and cons about the caregiver. This can include everything from small complaints to large concerns, as well as all of the benefits and elements of improvement they provide. Get an unbiased party to go over your list with you, as well. This will help you better assess areas where you might not notice your own contributions to the issue. Once you have all of the information, you should also sit down with the caregiver and see if there's a common ground or way to minimize any issues. Once you've exhausted all options, you may find that the caregiver or agency isn't right for your family. You need to go with your instincts in these cases. It's important that you have a home caregiver you can trust to truly have the best quality of life. An agency may or may not reassign your caregiver in this situations. If you do find that the agency you're currently with is not meeting your needs, it's time to start considering other agency options. One great way to research alternatives is to look for online reviews or stories from customers, who have direct experience working with the agency and can give you a fuller sense of their care experience. We’re happy to consult with and advise you on getting the high-quality care you deserve. If you’d like to schedule a time to talk to an expert in your area, please feel free to contact us.